...and then jumped again, onto a table. These are two more terrific shots of this handsome little devil! Ray: A seriously pretty character, and with a wonderful personality, Elizabeth. An albino spider, Ray??? How many eyes does it have/need??? Ray: It has 8 or 10 eyes, Ginnie, so must surely have a great view of what is happening around. Ray: A wonderful little character, Lisl, and it seemed to be deliberately playing games with me. Elle est drôle avec tous ses yeux. Ray: Huit ou dix yeux, et une personnalité merveilleuse, Martine. Ray: Thank you, Chris. This one was great fun. Oh, a sportive being with many eyes to have a look roundabout! Ray: Athletic, handsome, and festooned with a wonderful array of eyes and eyelashes, Philine. Clearly likes larking around Ray. Ray: That was certainly the impression it gave me, Chad. Ray: Thank you, Astrid. I had great fun playing with this one, and it seemed to be playing games with me. A wide-eyed wonder, with the expression of a sloth. Excellent macro. Ray: Thank you Louis. This one is tiny...way less than 1cm from nose to tail. I don't think I've ever seen anything like this for real. 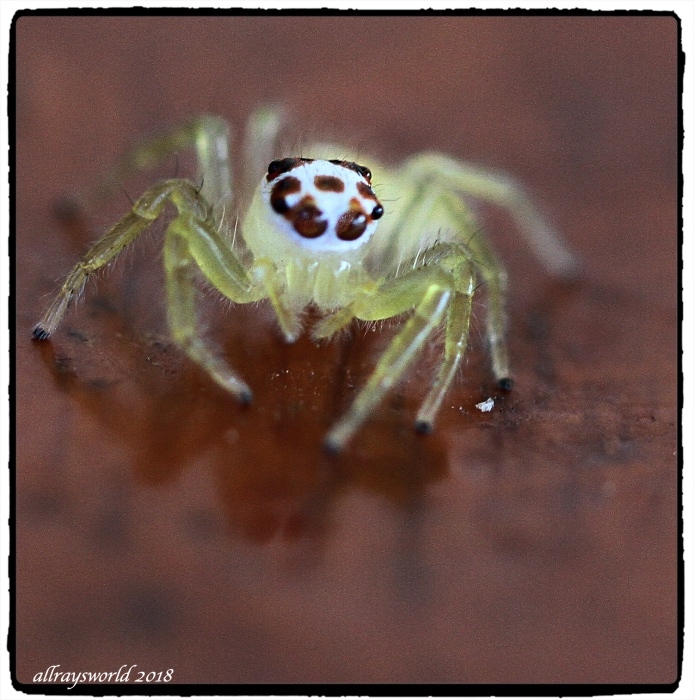 Ray: We have many Jumping Spiders in the house and garden, Brian...wonderful guests. It really is a cutie. Ray: I had great fun interacting with it, Mary. Phew.. that's a relief. I was convinced that you were going to be a gonna. Ray: I particularly like her white head top, Larry. Terrific - and it can't escape you! Ray: I put my arm on the table, and she obligingly leaped down, Tom.